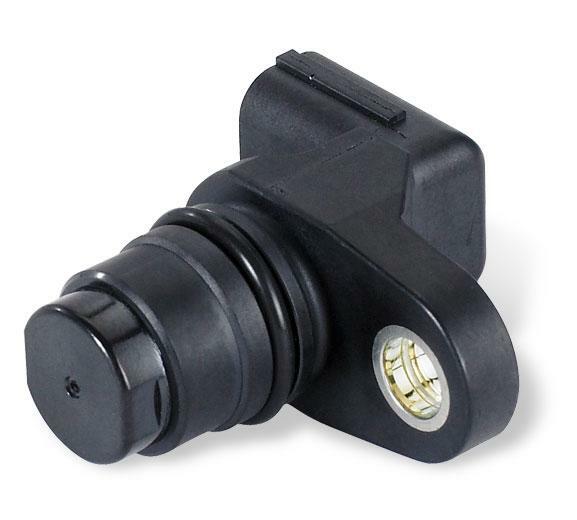 Camshaft and Crankshaft Position Sensors detect camshaft and crankshaft rotation during one engine-combustion cycle. DENSO produces both Magnetic Resistant Element (MRE) type and Magnetic Pick-Up (MPU) type sensors. DENSO MRE sensors have a pair of MREs on an Integrated Circuit (IC) chip – this unique design is extremely accurate, even just after an engine is started. The molded IC chip is installed inside a cylindrical magnet so it is positioned closer to the gears that rotate with the cam or crank shaft – this design is almost 10 times more sensitive than Hall element type sensors. DENSO uses a Polyphenylene Sulfide resin coating over the molded IC chip and cylindrical magnet for greater strength and superior resistance to substances like fuel, engine oil and emission byproducts.